After an attack on a Federation colony, the Enterprise is asked to track down the alleged perpetrators, Bajoran terrorists. The Bajorans are (ahem) a race of refugees, forced from their homeworld (ahem) decades earlier by the Cardassians (whom we met in “The Wounded”). Admiral Kennelly (Cliff Potts) comes on board and tells Picard he must take on a Bajoran officer, the disgraced Ensign Ro Laren (Michelle Forbes). Ro has spent some time in prison after her actions resulted in the death of some officers, and her assimilation into the crew is difficult as several crew members (Riker and Geordi, notably) make it clear they object to her very presence. She helps Picard find the terrorist cell but then works separately, with direction from the admiral, to undermine the mission. 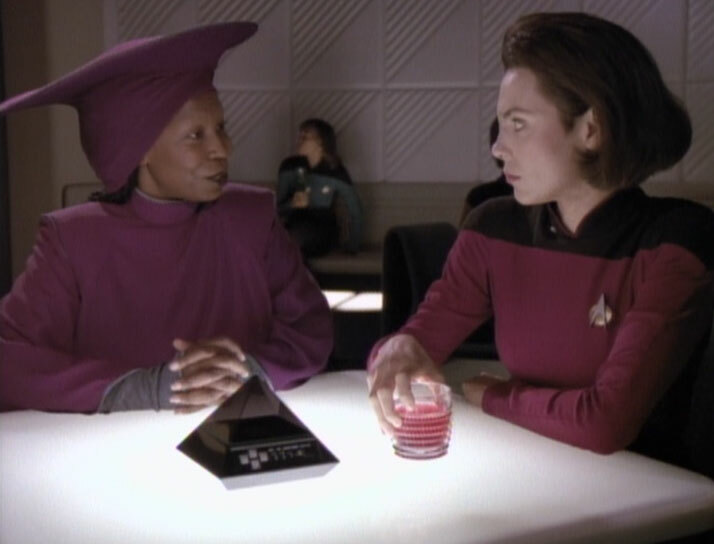 Guinan befriends Ro and gets her to come clean to Picard. With Ro’s help, he uncovers a plot between the admiral and the Cardassians to flush out the Bajorans and end the terrorist threat. Picard then tells the admiral that the Cardassians used him — that the Bajorans couldn’t have attacked the Federation colony, as they don’t have the ability to travel far or fast enough to have carried it out. Picard then welcomes Ro to the crew. Ro, Picard and Data in in a world of blankets. Ro becomes a quasi-regular over the next season-plus and shows up again in the seventh season (eight episodes in all). She was a nice addition to the cast that, too often, had no conflict and could be kinda dull. But, really, the setup here between the Cardassians and the Bajorans is key — despite the rough edges we’ve come to expect with the TNG/DS9 handoffs. The Cardassian look is still off here — we see the weird uniforms from “The Wounded” again — but this episode kept the Cardassians from being one-off baddies that we never see again. So, good on that. Lastly, this is one of the clearest examples — though not really the first — of the Federation bending overly backwards to make a connection with a former foe (or, to generally avoid conflict). We saw a bit of this in “The Wounded”, when Picard is told to avoid a war at all cost because Starfleet isn’t in the position to deal with the conflict, a possible allusion to the aftermath of losing 40 ships to the Borg. But, going forward, the Federation really does some odd things to appease the Cardassians. In finalizing the treaty, they agree to put a bunch of Federation colonies in Cardassian space and a bunch of Cardassian colonies in Federation space, which was a pretty clear tactical fail. And it spurred the terrorist Maquis into action. I’m glad that it’s always made clear that the Federation doesn’t attack first, as it really does fit with Roddenberry’s vision in the best possible way. But does the Federation have to be so appeasing that it does dumb things — like conspiring with Cardassians in this episode to kill some fairly harmless Bajorans? 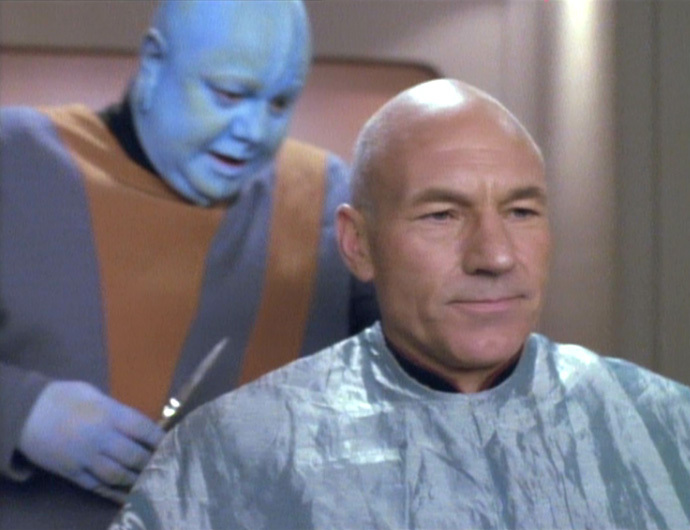 Mr. Mott, the best barber in Starfleet, makes one of his few on-screen appearances. Well, put simply, the Bajoran back story is pretty much completely redone for DS9, much like our buddies, the Trill. The look of the Bajorans stays and the Cardassian occupation is still a key point. But the result of the occupation totally changes. 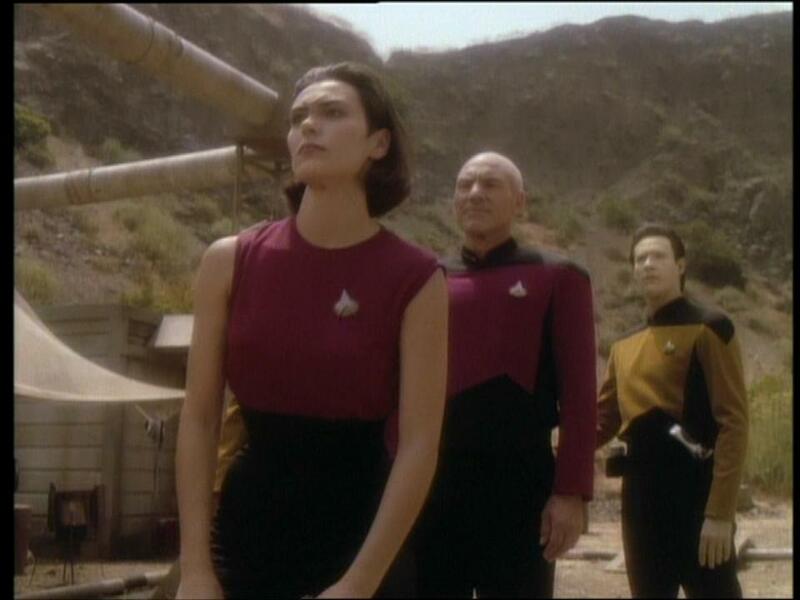 In “Ensign Ro”, Bajorans — or “the Bajora” as they’re called here — are essentially gypsies. They’ve been forced to relocate to worlds all over the quadrant because the Cardassians annexed their homeworld. That, of course, makes this episode possible, because the Bajoran refugees aren’t in Cardassian space, where Picard and Co. couldn’t reach them. The Bajorans here are apparently just around Cardassian territory — and their proximity (presumably) allows them to carry out terrorist actions. But in DS9, the back story is VERY different. We don’t really hear about Bajoran refugees. It’s possible they existed, but given the Bajoran-heavy storylines in early DS9, there’s no indication that Bajorans returned to Bajor en masse — as they don’t appear to have really left at all. Instead, we hear about Bajorans who were essentially slaves to the Cardassians in the Bajoran system. The resistance fighters were terrorists (like those we see here), but they weren’t operating on far-flung moons in other systems. They were (as far as we ever see) restricted to Bajor and its moons. Couldn’t the terrorists have gone back and forth between Bajor and other systems? Well, the information that proved the Bajora’s innocence here (that they couldn’t travel at warp speed to get to the colony that was destroyed) and information to that effect in DS9 (Bajoran ships that we see are all impulse-powered, though they know about warp drive) would indicate that the Bajoran terrorists would have been restricted to one system, be it Bajor or elsewhere. Now, an obvious question remains: If the Bajorans that we see in this episode aren’t capable of traveling at warp, why would the Cardassians see them as a threat? At least on DS9, you could see how the Bajorans could travel the system and actually cause problems for a nearby occupying force. But if the Bajorans are spread out among several systems and are limited to impulse speeds, the Cardassians shouldn’t be at all bothered by them. It would take YEARS for a Bajoran terrorist ship to get close to Cardassian targets (presuming that Bajorans aren’t gypsies on Cardassian planets). And if other Bajoran terrorist than the ones we see in this episode could travel at warp, why are the Cardassians busy going after the cell we see in this episode? Wouldn’t they have other hasperat to fry? It’s not a huge thing, but apparently Worf and Ro attended Starfleet Academy at the same time, with Worf graduating in 2361 and Ro graduating in 2362. Given both their personalities, it’s not hard to imagine that they weren’t social types who wouldn’t have associated with other students, let alone each other — and we have no real idea how many students attend the academy at the same time. However, it would have been interesting had the connection been made in the episode, with a line of dialog from either character. FWIW, Riker and Geordi both graduated in 2357 (making Riker’s officiousness to Geordi in “Encounter at Farpoint” strange in retrospect) a year before Worf and Ro started at the Academy. Riker intimidates a Ferengi, Troi flirts with a Zakdorn and Worf sings Klingon opera in a bar. Oh, and Picard meets Spock or something.